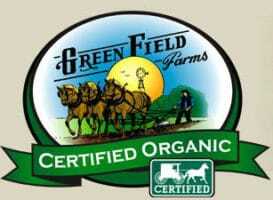 They say: “Each member family of Green Fields Farms follows a strict set of principles to ensure we produce high quality and wholesome food products. Traditional farming methods are maintained for two reasons. First, we want to remain good stewards of our precious land. Second, we believe there is no better way to instill core family values that raising our children on working farms that grow food for the community around us. Our farms grow most of their own animal feed, redistribute animal waste as earth-friendly fertilizers, and naturally control pests and weeds. Fields are cultivated with horse-drawn plows so we can constantly monitor the health or our land and crops- an impossibility when sitting atop a massive tractor. Hence, we don’t need to rely on harmful chemicals to discourage weeds and pests. In short, each farm is a small ecosystem that promotes natural ways for plants, animals and soils to thrive.